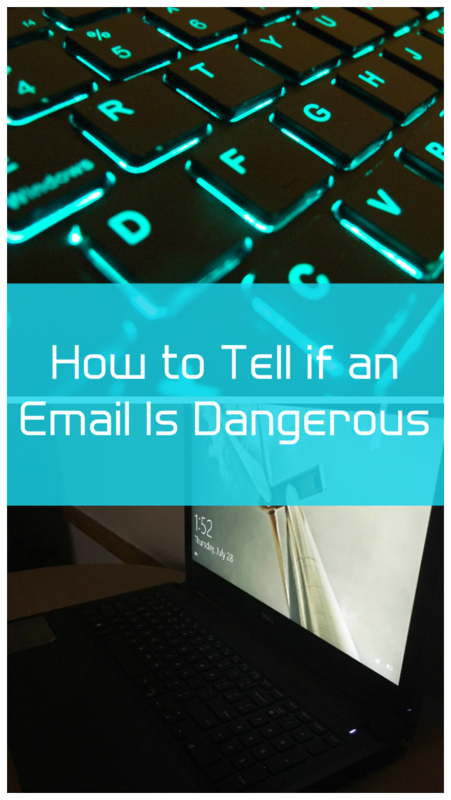 As I mentioned in my post about computer myths and contrary to what most people think, email can be an unreliable and downright dangerous way to communicate. This post may contain affiliate links; see my disclosure here. Most chain emails contain largely lies or online scams. By chain emails, I mean the ones that encourage you to forward them to everyone you know. They often have an urgent tone and can go into significant detail to make the message seem more convincing. Some chain emails claim that the information has been verified by an official-sounding organization. If the agency or company is reputable and even exists, chances are slim that they actually endorsed a chain email. Anything political in nature is suspect. Personally, I don’t believe it’s okay to spread lies about someone I don’t like, but untrue political messages spread like wildfire through email and social media. Then, there are the common hoaxes that continue to circulate here and there, claiming that everyone should be on the lookout for something terrible that happened to a friend of their brother-in-law’s cousin’s acquaintance. Or, a particular product on the market is extremely dangerous because two people out of millions who used it had a problem with it, according to some “expert” who might not exist (or might not be much of an expert). Snopes.com is a good reference point for finding out whether a particular rumor is true. Anyone who claims that Snopes has some particular political agenda hasn’t read much of the site. I’ve used Snopes as an excellent resource for many years, and they are an equal opportunity debunker. If they expose more lies about a particular political party or figure, it’s because there are more lies about that group or individual going around. 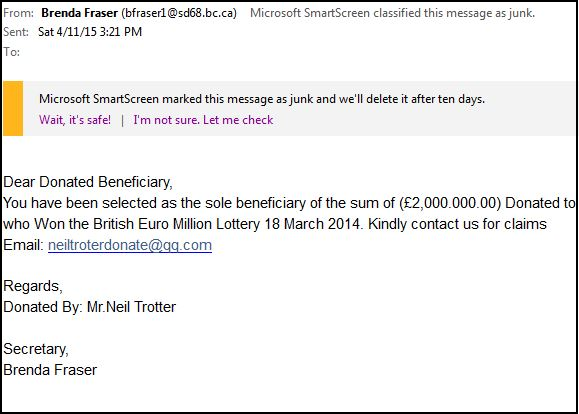 So, you have the lottery online scams, hoaxes and urban legends making the rounds. And you receive boatloads of spam messages offering help with weight loss, matchmaking, male enhancement and so forth. Even worse are the emails that can infect your computer with malware or expose your personal information to overseas criminals. 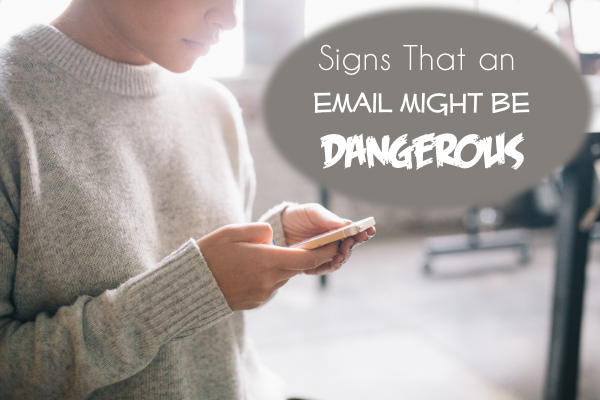 These emails can do a lot more damage than just spreading rumors that aren’t true. You might get an email from someone you know or whose email address you recognize, and the message contains a short phrase, such as “Have you seen this?” with a link to a website. Do not click this link. Just don’t do it. Your friend’s email has been hacked. He/she clicked on a link in a similar email, which caused malicious software to send out emails to everyone in the sent mail folder. If you click on the link, the same thing will happen to you. Your computer might send a bunch of emails and be done with it, or it might turn into a spam message server which continuously sends out junk emails until something stops it. Your antivirus software may not protect against this type of thing. The federal government generally does not send unsolicited emails to citizens, but sneaky criminals assume most people don’t know this. I received a message the other day claiming to be from the IRS. The timing was right, since it’s mid-April and I filed my tax return recently. 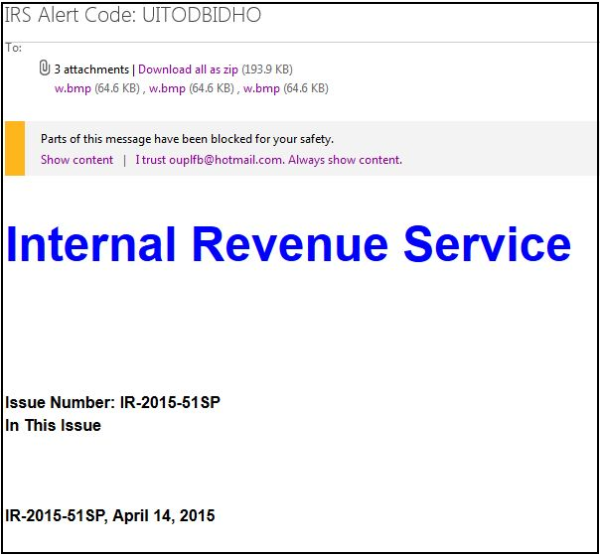 However, I know that the IRS does not contact taxpayers via email, and this scam email wasn’t even a convincing one. The same day, I received an email allegedly from E-ZPass. I actually did drive on a toll road recently and received a bill in the mail for all of 88 cents from NC Quick Pass. 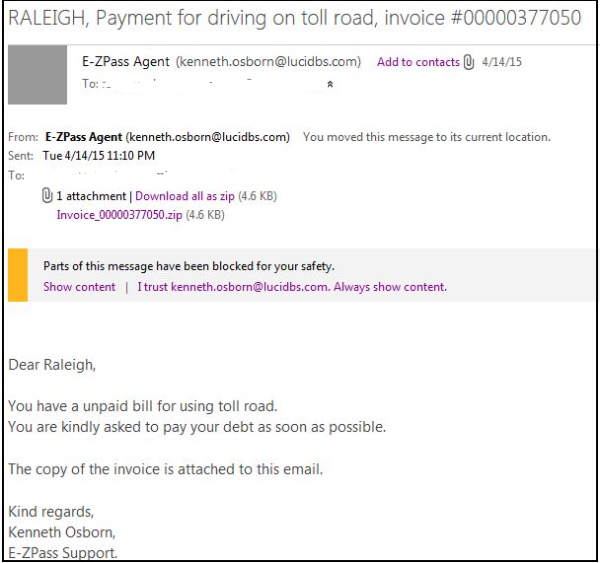 I don’t know if some thieves coincidentally sent out a mass email claiming to be from E-ZPass or if they had access to information about drivers who had recently received toll road bills. I could tell that the email was bogus in several ways, not the least of which is that government agencies don’t usually contact people by email. Also, I can’t think of any way that E-ZPass would have my email address. Plus, the links in the email and the email address linked to domains having nothing to do with E-ZPass. My snail mail bill for 88 cents came from NC Quick Pass, too, not from E-ZPass. I’ve also seen emails claiming to be from the FBI that threaten fines or even arrest if a fine isn’t paid via credit card, gift card, Bitcoins, or Western Union. They may seem scary, but they’re scams – thieves trying to extort money from innocent people. The FBI does not reach out to citizens via email. If you’re going to be arrested, they’ll show up at your door and haul you away. They won’t offer a deal via email. 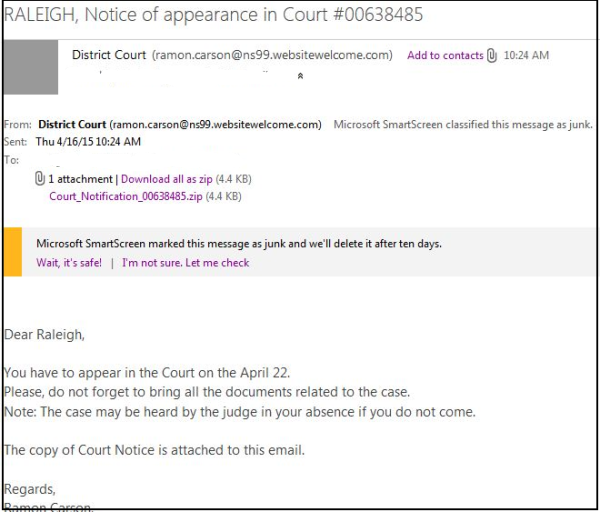 Emails ordering you to appear in court are also phony. PayPal, banks and other financial institutions will not ask for personal information via email. If your bank or credit card issuer believes your account may have been used fraudulently, they will probably call you on the phone rather than email. If you do receive an email from a bank you have an account with, do not respond or click any links in it. Call the bank using the number on your credit card or directly from the company’s website and inquire about the message. Criminals are also using phone calls to scam customers into giving out their credit card information. They might already have the card number and expiration date and just need the three-digit code from the back. So, they call you and claim to be from your bank’s fraud department, saying that your credit card has been compromised and that they need the three-digit CCV code to verify that the card is in your possession. If this happens to you, hang up and call the number on the back of your credit card. Your card has indeed been compromised, by the scammer who called you. Unfortunately, I have had my credit card numbers compromised on several occasions and had no idea how it had happened. I take significant precautions to protect my credit card numbers, but it still happens. The last time a credit card company contacted me about fraudulent usage, I told the guy on the phone that it had been a year or two since this had happened to me. He said that was pretty good, since it happens to most people once or twice a year on average. If a credit card issuer’s computers detect suspicious activity, they’ll call you on the phone. They might possibly send an email as well, but I recommend speaking on the phone rather than taking care of this online. They will ask if you have the card in your possession, but they have never asked me to read off any numbers from the card. Emails that try to trick you into disclosing private information are called “phishing” scams. They pretend to come from a variety of well-known websites such as eBay, or even from your email provider or IT department. Any email that tries to get me to enter personal information into a form or website gets marked as spam. Dropbox is a fantastic cloud storage service that lets you easily access your files on the go and share files with other people. Scammers have jumped on this capability, sending out millions of messages to people with links supposedly to a genuine file that someone shared with you via Dropbox, Box.com, Google Drive or another file sharing service. It might even appear to come from somebody you know. Don’t click on it if you don’t know the sender. If you do recognize the email address sending you the link, call that person to verify that they actually sent you that link and that it’s legitimate. 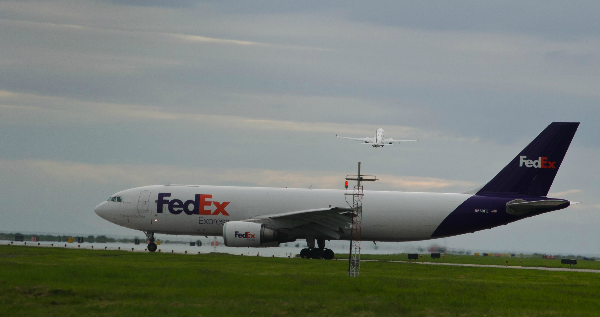 Criminals commonly send out spam messages claiming to be from FedEx or UPS which include a file attachment “invoice” or “delivery notice.” Allegedly, the driver couldn’t deliver a package or needs payment for a package. Scammers also send messages that look like they’re from companies with legitimate-sounding names, or even from well-known airlines or hotel chains. The email may include a file attachment – supposedly an invoice, receipt or credit slip – which you absolutely should NOT open. You might be very tempted to open the file attachment. 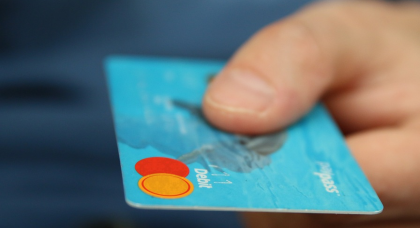 It might claim that a company charged your credit card for something you didn’t buy or that it needs to credit an amount back to your card for some reason. Opening the file could infect your computer with malware and/or cause it to start sending out thousands of junk messages. It is important to monitor your credit card statements for unusual activity. If you just pay the bill without spending any time looking at it, you may miss suspicious charges. If your email has been hacked, you need to have your computer checked out and cleaned of any remaining malware. Then, change the passwords to any sites you may have visited since the incident, especially email and banking websites. If you have lost money to any type of scam, including giving your credit card number to criminals selling fake antivirus software, report it to the appropriate authorities. Immediately notify the issuers of any credit cards involved in the scams. The bank will probably cancel the compromised card and issue you a new one to protect against further charges. You should also contest any shady charges to avoid paying them. British comedian and writer James Veitch has become famous for engaging with email scammers, with hilarious results. His series on Mashable includes some hysterical exchanges with scammers, such as one who claims to want his help in moving $9 million. His TED talk had me falling out of my chair laughing. This article was originally posted in April 2015 and updated in June 2018.